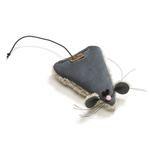 Cats will love to run around with this soft Big Sky Mouse Cat Toy! Cats will love to bat, pounce and play with this adorable mouse shaped cat toy while cat owners will love that it was made from left over Big Sky Blanket fabric so it reduces waste. Complete with whiskers, a stretchy tail, a charming bell and USDA certified organic catnip! Made in Montana! We love BaxterBoo! Our dog is quite anxious and we just moved from Nevada to Pennsylvania. She's old and has joint pain and the new climate has been tough on her. She's also a "bigger" girl so we very unsure about clothing for her but decided to try a t-shirt.... When we were shopping we decided to also search for a warm sweater for this winter.... She doesn't like to be cold.... We found the most adorable sock monkey wool sweater and ordered that too. Much to our surprise she doesn't want to ever take her t-shirt off so we just ordered three more colors - and she loves her sweater!! We're so happy to have found such a great company that has "fun" styles and products and makes our girl so happy!! The prices are fabulous and their customer service is wonderful! Thank you BaxterBoo!! !